Viper GT2 On The Way? Dodge Motorsport Europe confirmed to dsc today that a very significant development programme indeed is now underway for the Dodge Competition Coupe in Europe. Michel MacBurnie from the Oreca based outfit confirmed that subject to the satisfatory outcome of a meeting this week in Valencia the current FIA GT3 spec car will have an upgrade kit developed to enable the big V10 coupe to compete in the GT2 equivalent GTA class in both the International Open GT and associated Spanish GT Championship. "The required upgrade kit will include enhanced engine performance, a new braking system and a sequential gearshift." There are however no immediate plans for an upgrade to full FIA GT2 specification, this would require substantial modification to the rear bodywork, rear wing and front splitter, the Competition Coupe has different rear bodywork to the roadgoing SRT10 and this ensures that homologation to full GT2 spec is less than straightforwrd. - It is not however completely out of the question. 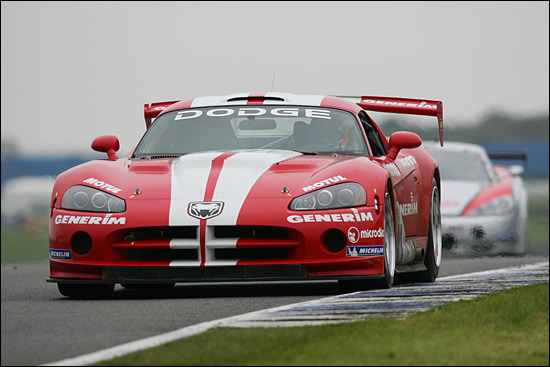 It seems that there are conversations underway with Dodge in the US but no move is likely towards full GT2 homologation before 2008. The Competition Coupe has proved to be a popular buy in Europe, 20 cars are now racing on this side of the pond and, with more national GT3 series now planned (with a German series and Belcar looking to adopt GT3 regs too) the future looks bright. "There are two cars in Europe that were sourced direct from the USA (the pair of Dutch Supercar Challenge cars) but we have sold a total of 18 and there is a lot of further interest." As far as the FIA GT3 Championship is concerned it looks likely that Racing Box and Pouchelon would like to return. Indeed it is Racing Box, already running GT3 spec Dodges in the FIA GT3 Championship, that are reportedly already involved in the GT2 / GTA development programme and it seems the team have outline plans to enter the first prototype of the Dodge Viper GT2 FIA in the last race of the 2006 Spanish Championship at Montmeló on 11-12 of November if things run to plan. Their 2006 FIA GT3 competitors though from Racing Logistics seem set not to return in 2007and paddock rumours suggest that their cars might be sold. Other teams are interested in stepping up but a decision is awaited from SRO on the final shape of the regulations which currently specify no more (and no less) than 2 x 3 car teams per marque.